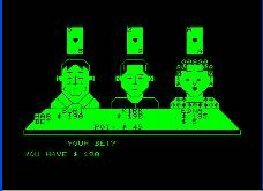 BETS (1980) for the Commodore PET: While many games for Commodore's PET computer were purely text-based, some, like Randall Lockwood's BETS (1980), seen here via the VICE: PET emulator, implemented comparatively excellent visuals and animationsAs part of the editing process for my upcoming US home videogame and computer entertainment systems history book, I've been logging the software I mention in each section. I thought it might be interesting to list the software I'm mentioning in the book for the 1976 - 1979, computers section, which I just finished going through. Most of these are the cream of the crop or notable titles. How many of the following are you familiar with?